There are 15 Memory Care Facilities in the Bradenton area, with 14 in Bradenton and 1 nearby. The average cost of memory care in Bradenton is $3,546 per month. This is lower than the national median of $4,650. To help you with your search, browse the 31 reviews below for memory care facilities in Bradenton. On average, consumers rate memory care in Bradenton 4.2 out of 5 stars. Better rated regions include Sarasota with an average rating of 4.6 out of 5 stars. Caring.com has helped 10 families in Bradenton find high-quality senior care. To speak with one of our Family Advisors about memory care options and costs in Bradenton, call (855) 863-8283. The gulf coast city of Bradenton, Florida, has a sizeable senior population of close to 24 percent and some of these seniors have memory impairments like Alzheimer's disease, Huntington's disease or dementia. There are over 80 memory care facilities in Bradenton to accommodate them. Many assisted living facilities in Florida possess a specially trained dementia care unit as the state is estimated to have over 500,000 residents with Alzheimer’s or other cognitive impairments. Dementia care programs can be stand-alone or located within shared assisted living facilities, and staff must undergo yearly training and education. Excellent weather with a comfort index of 83 out of 100 is one of the major benefits of living in Bradenton. The summer highs are a little hot and humid, around 90 degrees in July. Winter, on the other hand, is nearly ideal with a crisp January low of 51 degrees. Seniors are at risk for many potential health hazards in the environment, including air quality. Those with COPD, diabetes, and other related illnesses can be adversely affected by pollution. The air in Bradenton, however, is clean and carries a low risk. It was given a solid B ozone rating from the American Lung Association. It is about 11 percent more expensive to live in Florida when compared to the national average. However, Bradenton is only 8 percent above the U.S. average, making it cheaper to live here than in many other areas. Seniors and their families may be able to cut costs by living here. The tax situation in Florida is a huge benefit to residents of The Sunshine State. Social security income and pension IRAs are not taxed and there is no marginal state tax. This means finances may stretch farther here, giving seniors the opportunity for better quality care and more money for day-to-day expenses. Memory Care costs in Bradenton start around $3,546 per month on average, while the nationwide average cost of memory care is $4,800 per month. It’s important to note that memory care rates in Bradenton and the surrounding suburbs can vary widely based on factors such as location, the level of care needed, apartment size and the types of amenities offered at each community. To see a list of free memory care resources in Bradenton, please visit our Assisted Living in Florida page. 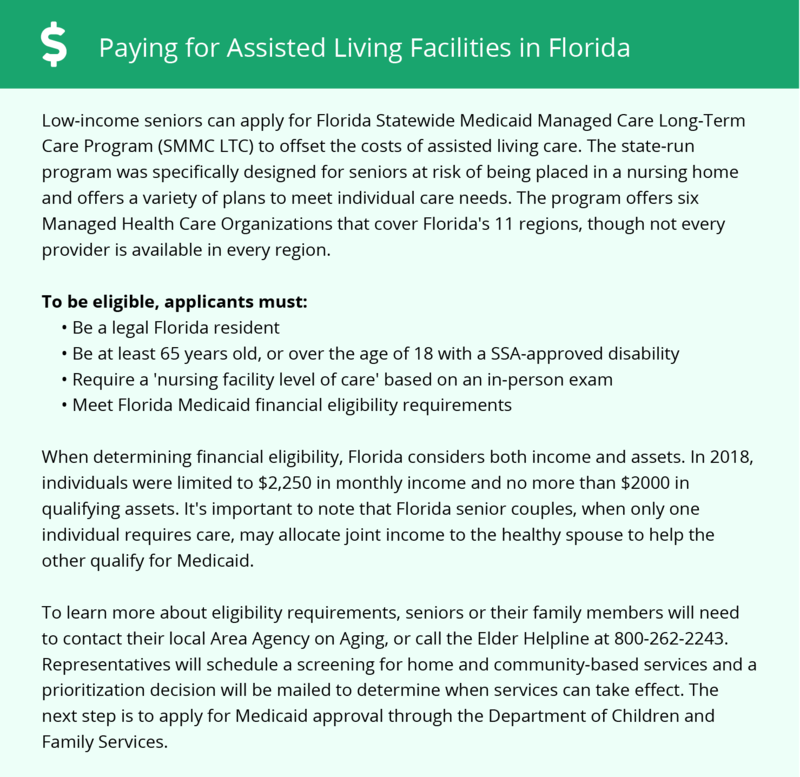 Bradenton-area assisted living communities must adhere to the comprehensive set of state laws and regulations that all assisted living communities in Florida are required to follow. Visit our Memory Care in Florida page for more information about these laws.